Book Marketing: Indie Authors – Know Your Publishing Rights! Understanding the full range of publishing rights available is an important part of building your author business. Many authors start off by self-publishing ebooks in their native language, then add print and maybe audio to their product range, and that is a laudable achievement – especially when effectively marketed and selling well. However, there are many more exciting and potentially lucrative opportunities to build different income streams from those same books by licensing various publishing rights for other purposes, such as audio, foreign language versions, branded merchandising, and so on. Just like book publishing, it’s also a potential minefield where unscrupulous third parties may try to fleece the uninitiated into unfavourable deals. 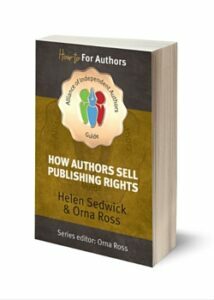 In the first of an occasional series on publishing rights for indie authors, we explain the lie of the land, in an extract from the ALLi Successful Self-Publishing Guidebook #3 , How Authors Sell Publishing Rights, by ALLi director Orna Ross and professional lawyer Helen Sedwick. How might I sell my books abroad? What’s the best way to get my books into bricks-and-mortar stores profitably? How might I sell translations of my books? What about other subsidiary rights, like radio, film and television? How do I best exploit my intellectual property? As well as selling ebooks and print-on-demand (POD) books directly through online stores across the world, indie authors can also engage with trade-publishing where advantageous, for digital, hardback, and paperback print publication, as well as other rights like audio, translation, television, film and merchandising. The expanding market for authors creates challenges. As opportunities have opened up, so has the risk of writers signing bad contracts and failing to protect their rights. We have seen authors make painful mistakes, granting to a small, English-language publisher, or even a vanity publisher, all rights to print, ebooks, abooks, translations, films, television, and other subsidiary rights for the life of the copyright. Or they are seduced by offers from overseas “publishers” in countries that are not covered by copyright agreements, or where piracy is rife, or payment unlikely. The risks are higher now that so many writers are negotiating these agreements without the benefit of an experienced literary agent looking out for them. Finally, the rights market is tremendously fragmented, and getting more so. Publishing houses and production companies come in every size and shape, from individual authors publishing other writers’ works to huge global conglomerates and Hollywood studios. A typical book contract will look radically different from a movie deal. Plus the size, efficiency, niche, ownership and traditions of each company vary enormously, as does the ability of each company to exploit an author’s work successfully. All this complicates the task of choosing which publisher and which producer is best for our work, and which opportunities are best explored independently and which require an agent. 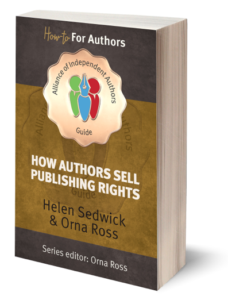 ALLi’s Successful Self-publishing Guidebook #3, How Authors Sell Publishing Rights, by ALLi director Orna Ross and professional lawyer Helen Sedwick, has been written to empower and enable you to understand the rights landscape and how to license your rights without giving too much away. It will open your eyes to new avenues to give your work worldwide exposure in multiple formats by the thoughtful selling and sharing of rights. It discusses the trade-publishing and self-publishing sectors, which at the moment largely operate independently of each other. It also explores opportunities beyond print and ebook formats and highlights avenues for breaking out into new languages, territories and markets. As a successful indie author running an author business, you deserve to make the most of these exciting opportunities, so do not miss this succinct, clear book written by leaders in their fields. It’s available in ebook and pbook, and paid ALLi members are entitled to a free download as one of 21 benefits of joining our organisation. For more information about how to gain the 21 benefits of ALLi membership, click here.